We love making homemade costumes! We put them together for Halloween, occasional conventions, and, sometimes, theme parties. It's always a team effort. Pip - the one who will be wearing the costume. She's responsible for choosing what character she wants to portray, assisting with shopping for materials, standing patiently for fittings, and not complaining about how long it takes to achieve whatever hairstyle the costume requires. Mimi - the seamstress. I used to ask my mom to "help me" with the sewing portions of the costume. Now I am more realistic and I ask, "would you be willing to sew this?" She's pretty great about it, especially considering the random materials I sometimes bring her and that oftentimes she's creating a look without a pattern. Chris - the sculptor and builder. He handles much of the detail work and anything that needs to be sculpted or painted (armor, amulets, shields, props, masks, etc). Me - the gatherer and the hairstylist. I am often the one hunting in thrift stores and discount bins for the items needed to make the pieces, and making sure we stick to the budget of "as close to $0 as possible." When it's costume day, I'm the one helping Pip get dressed and doing hair. 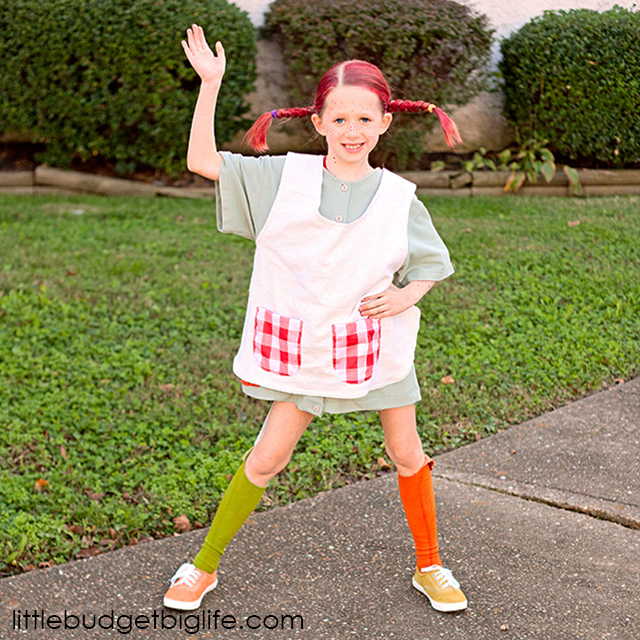 Her costume for this year is currently in the works, but here's a peek at last year's look: Pippi Longstocking. At the time, she loved the Pippi movies from the late 60s/early 70s so that was our inspiration. Chris cut the tights into very long socks. He then mixed up the orange and green Rit dyes according to package directions and dyed one each color. Rather than dipping the shoes, he took the laces out and painted one with each of the dye colors. When Pip put on the costume, we made sure the socks and shoes were opposites, and we used one sheet gripper to attach a sock to her bloomers to look like a single garter. The green shirt remained as it was, and served as the basis for the dress. Mimi cut three patches out of an orange ribbed sweater for the front and back of the dress (you can see just a sliver of one in this photo). She then cut the swaddling blanket into an apron that crossed in the back and sewed that together, adding the checkered pockets afterward. My job of turning Pip's hair red was more of a chore than I expected. When I finally got it combed through fairly evenly, I had to work quickly as the type of temporary hair color that we had purchased started to stiffen up after a few moments. I had already cut the straight bottom piece out of a wire hanger using the wire cutter on my needle nose pliers, and Chris held it across the back of Pip's head while I braided each side of her hair around it. After both braids were secured with elastics, I trimmed the end of the wire so that it didn't extend farther than her hair--I didn't want any other kids to walk into it on accident! Finally, Chris dotted some freckles on her face, neck, and arms with the Sharpie. This costume turned out to be quite affordable, and very cute. Most importantly, Pip loved it!